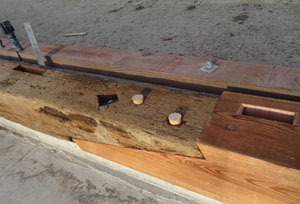 A 150-year-old redwood sill plate, left, is linked with pegs to a newly crafted redwood sill, right, to support barn bents. Tenons on the bents will fit into mortises cut into the sill plates. Timber framers in red shirts clamber on the structure as they link the pieces together. The horizontal "girt" in the center is a salvaged piece of the original barn built in the 1860s. Sunday afternoon, the first ridge beam is about to be set after six pair of rafters are in place. 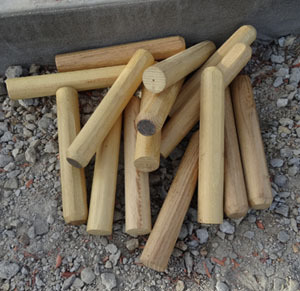 Locust pegs from New Hampshire complete the mortise and tenon joints that link timbers. James Wiester makes an on-the-spot adjustment to a tenon for the installation of a plate. 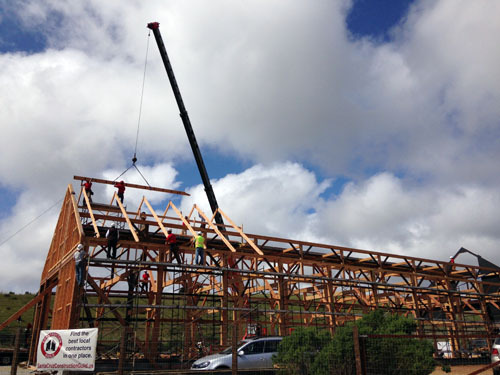 With 11 bents in place, workers prepare for the next layer of the new Cowell Ranch hay barn. When the barn is complete, the timber superstructure will be visible from the inside. 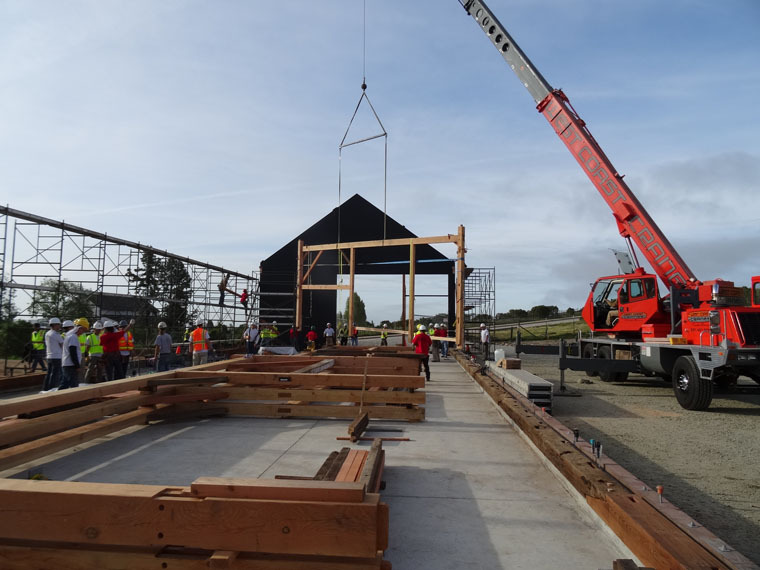 At 9:03 a.m. a cheer went up: The first timber structure for the revived Cowell Ranch Hay Barn had been hoisted, set, and secured. Working south to north, seven more would follow before lunch, with the final three completed by 1:25 p.m., lifted by a crane and settled onto 10-inch by 10-inch redwood sill plates bolted to a concrete slab. 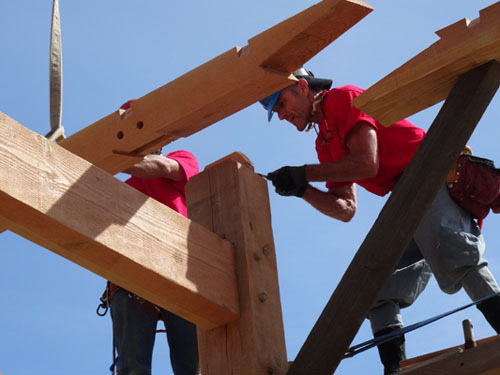 The barn raising Saturday, March 21, 2015 at the base of the UC Santa Cruz campus progressed remarkably smoothly with about 20 professional timber framers leading the action and a crew of 50 skilled volunteers supplying additional labor. By noon a large crowd had gathered on a nearby hillside to watch the installation of massive but intricately fitted timbers. By late afternoon Sunday, all timber framing was finished. Framers had assembled the structures known as “bents” on the ground before Saturday’s raising. 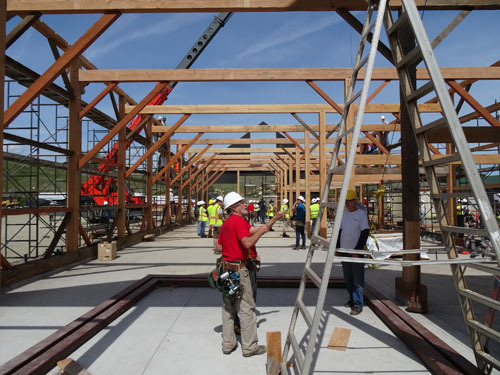 Weeks earlier, skilled apprentices, led by master framer Karl Bareis at Santa Cruz Timberframes in Bonny Doon, crafted each timber according to a precise plan. Each bent consists of a 40-foot-long Douglas fir beam attached to three 8-inch by-8-inch posts 18 1/2 feet tall and secured with horizontal “girts” and diagonal redwood braces. Bents form the primary structure for the re-creation of the hay barn that was built in the early 1860s. The timbers are joined by interlocking mortises and tenons, secured by locust wood pegs, a framing technique that dates back to 19th century New England. The barn is being rebuilt as a center for UC Santa Cruz’s environmental and sustainability programs and will become the home of the Center for Agroecology and Sustainable Food Systems and a campus and community hub. The project has been made possible by the Helen and Will Webster Foundation. Saturday afternoon, Alec Webster, a machinist with UCSC’s Institute of Particle Physics for 15 years, and a UC Santa Cruz alumnus (College Eight, 2002, Environmental Studies), recounted for 125 guests who had gathered for the barn raising celebration that several years ago he pointed out the barn to his father, Will, and said he wanted to restore it as a center for environmental programs. Alec Webster said he admired the skilled craftsmanship in the original barn and hoped to replicate it in a restoration. The new barn brings together historic timber framing with modern construction. The original barn was dismantled in 2014 with pieces inventoried and cataloged. What could be reused was. “It’s a balancing act,” explained Berkeley architect Richard Fernau, of the use and placement of old timbers. Fernau, a member of UCSC’s pioneer class, and his firm Fernau & Hartman developed the detailed project plan. The original pieces add authenticity and history, the new timbers add strength and support. “This is going to be a teaching tool,” Fernau said. 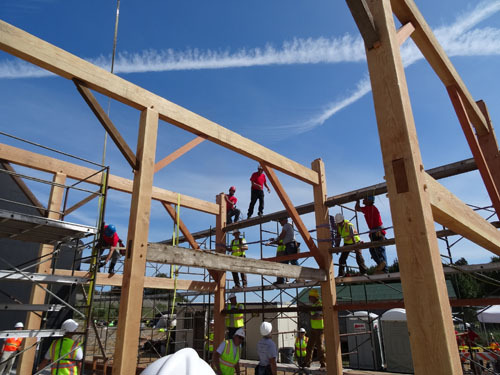 “It tells the story of what was here.” The timber framing, old and new, will be visible inside when the barn is completed by fall. Fernau noted that five other members of his pioneer class were on hand for the barn raising. One, Santa Cruz videographer Eric Thiermann documented the events. The barn has become part of UC Santa Cruz’s yearlong 50th anniversary celebrations, which will culminate in late September, 50 years to the day that the first class was held on the new UC campus built on the old Cowell Ranch. The hay barn site lies at the heart of the nationally registered Cowell Lime Works Historic District. In its day the barn most likely sheltered hay and oxen used to haul wagons that carried limestone to lime kilns and the redwood used as fuel for the kilns. Construction is proceeding in two phases. When the current phase to complete a weather-tight exterior is finished, the barn will contain a large multipurpose space for exhibitions, assemblies, and barn dances, among others, along with a 300-square-foot conference room, restrooms, and utility rooms. A future phase – still to be funded –will add other conference rooms, kitchenette, and exterior improvements – landscaping, an outdoor gathering area and amphitheater, picnic area, graded path to the farm, and bike racks.